The property is located in Currie Township near the township of Matheson in Northern Ontario with excellent infrastructure. Work performed by Metals Creek has included linecutting, geological mapping, ground geophysics and diamond drilling. 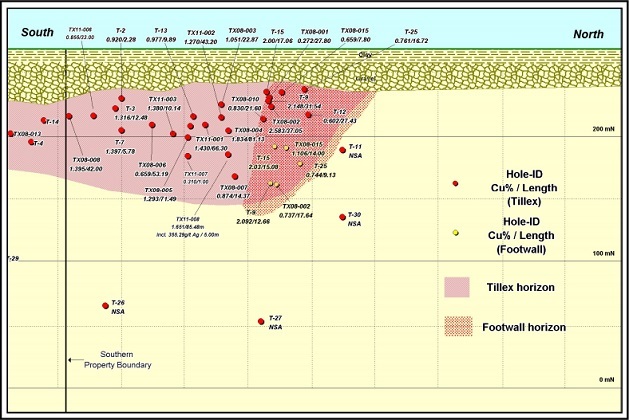 The Tillex project is host to the Tillex copper deposit which was originally discovered in 1973 by Westmin Resources Ltd., where 17 drill holes were completed and the claims were taken to a lease. 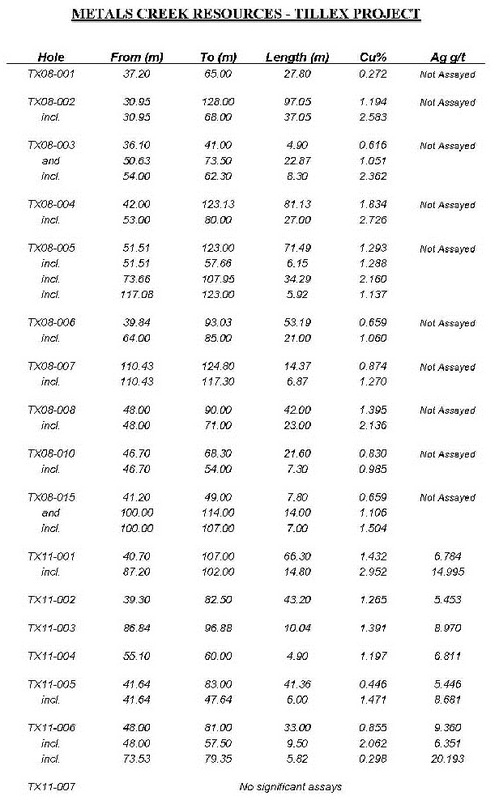 A historic non 43-101 compliant near surface resource of 1,338,000 tonnes grading 1.56% Cu was calculated in 1990 on the deposit by Pacifica Resources Ltd.
Metals Creek completed an EM-MAG survey and a 2276m drilled program in 2008. 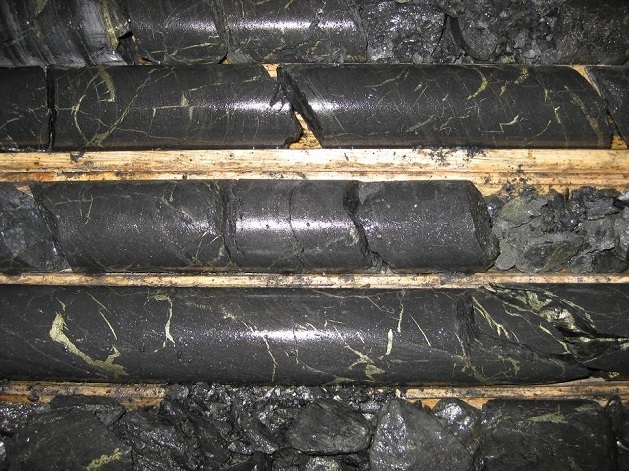 Highlights of the drill program include TX08-002 97.05 m down hole intercept (30.95m to 128m) of 1.194% Cu including 37.05m (30.95m to 68m) of 2.583% Cu, TX08-004 81.13m down hole intercept (42.00m to 123.13m) of 1.83% Cu, including 27.00m (53.00 to 80.00m) of 2.73% Cu, and TX08-005 71.49m down hole intercept (51.51m to 123.00m) of 1.29 % Cu, including 34.29m (73.66m to 107.95m) of 2.16% Cu. The Corporation also recently completed an additional two drill programs including a 3 hole, 588m diamond drill program designed to increase drill density on sections of limited drilling. 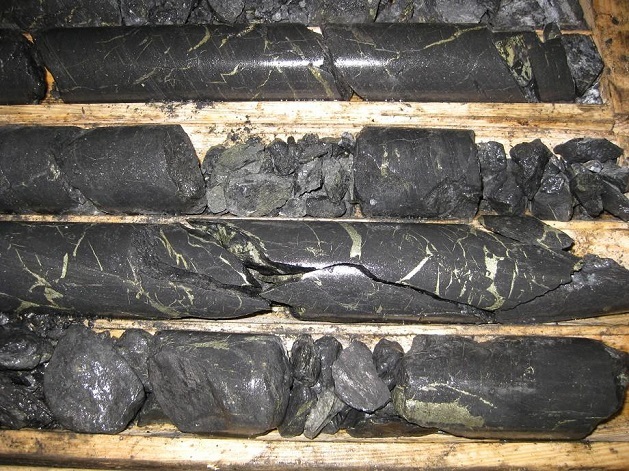 Assays include 1.43% Cu, 6.78 g/t Ag over 66.30m with the majority of the mineralization within 150m of surface. The second 5 hole drill program was also performed to continue to increase the drill density with results from this program including a 85.48m (meter) intercept of 1.65% Cu (copper) and 33.23 g/t (grams per tonne) Ag (silver) including a higher grade intercept of 5.29% Cu and 355 g/t Ag over 5m from hole TX11-008.